That hand-painted mug for Father’s Day or the glitter-and-glue collage for Valentine’s Day are treasured gifts. But the stains those projects leave behind are less than desirable. When we ship our little ones off to school or camp, we know there’s a good chance their clothes will come home in less than perfect condition. No worries! A few simple concoctions using stuff you probably already have around the house can ease your craft-stain woes. A simple way to remove some paint stains is with a combination of water and rubbing alcohol. Spray the stained area with water and then blot the area with a towel that has been soaked in rubbing alcohol. Nail polish remover can also be used a substitute for rubbing alcohol if necessary. Make sure you’re in a well-ventilated area! Dealing with glue stains or residue can be a bit tricky because there are so many different kinds of glues. We suggest taking a dull-bladed knife and gently scraping away at the the bulk of the glue. Once you have done this, soak the garment or wash it in the hottest water possible for the piece of clothing. This loosens up the fibres of the material and gives the glue less resistance. If the stain is persistent, repeat the aforementioned steps. Glitter can be a great addition to an art project and a washer’s worst nightmare. 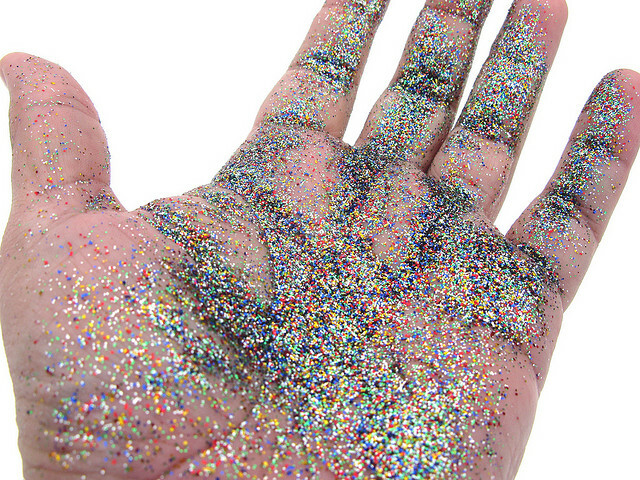 The absolute last thing that you want to do is shake the piece of clothing — it will simply spread the glitter around. Take hairspray and thoroughly spray it all over the glitter and wait until it has dried and hardened. Once it is, wash the garment as regular and the glitter should all be gone. If there is some remaining, repeat the previous steps. These are some of the more simple ways to remove a few stains caused by arts and crafts, but the best suggestion we can give: invest in a smock.